Stark picture, this boat has seen better days. I am convinced something grim happened here. The wind was at his back heading out of the bay. Coming home against the tide, every pull on the oars made his muscles burn and the relentless friction opened up his palms. Carrying the remains of this latest plague out to sea and dumping them far from shore had to be done. And he seemed to be immune so far. He’d thought about scuttling the boat several times and going down with the lost. His mother once called him an eternal optimist; he wished she were around to help buoy his spirits today. Seagulls shrieked and circled overhead. Almost home. ← This Happened In My Lifetime? Indeed – a thankless task, for sure. Thanks for noticing! I toyed with other seagoing terms, but stuck with that. I appreciate you reading! Good story this week, Erin. I like the idea that they would send the seemingly immune fellow to do this chore. Poor guy. Let’s hope he can build up immunity to that worst of all plagues, despair as well. I do believe despair will be what gets him in the end. Thank you for reading. What a horrible task. I felt for him. A wonderful bit of writing. Thank you,Rochelle. The photo was a good inspiration. I appreciate your feedback, always. This is a beautiful story, Erin and I enjoyed it thoroughly from start to finish. One note, which I hope you forgive me for including, but I add it because I think you’ll benefit from considering it and what the change will do to the flow of the sentence in question. 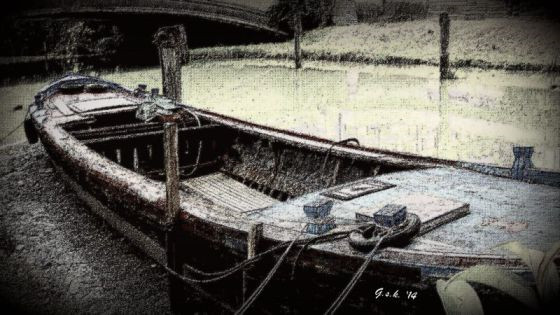 You write….Coming home against the tide, every pull on the oars made his muscles burn, his palms opening up from relentless friction. Consider…Coming home against the tide, every pull on the oars made his muscles burn and the relentless friction opened up his palms. Your call, of course. Just yammering. I felt that sentence had a glitch and was thinking this morning of how to smooth it out. I like your suggestion! Your advice is always appreciated – keep yammering away! Love your opening paragraph which wonderfully sets the scene for what is to come. Thank you for that! I appreciate you reading. Such a grim task. His feelings come through so strongly – thank goodness for optimists. I love the finish. Yes, very grim. I had a vision of where this took place and it is a hauntingly lovely area. Something as tragic as this is in stark contrast with that natural beauty. Lovely. I can tell you’ve rowed a boat and felt that pain. Your story reminds me of the great work taking place in the Ebola hit countries at present. More heroes there. Thank you, Patrick. I hadn’t thought of that comparison, but can see it now. I appreciate you reading. eerie and visual tale. wonder if he drew the short straw or if he was doing his part to continue humanity? Sandra has said what I was thinking about this piece, so I won;t repeat it, I’ll just add my ‘well done’ on a great piece of writing.